You are here: Home / Blogging / How to Become a Better Blogger? Every blogger wants to be read but have you ever wondered what can make you a better blogger? I am talking about being a better blogger and not about having a better blog. Every blogger wants to be read but have you ever wondered what can make you a better blogger. I am talking about being a better blogger and not about having a better blog. For a better blog you always need to write valuable content with clean layout etc etc but there is one of the most overlooked elements about blogs that is the blogger itself. So let me share with you few tips about how to become a better blogger? One of the reason people comment on your posts is because they want to interact with you, the blogger. If you do not reply, they feel ignored, and will not comment again. I always reply to each comment including thanks that readers leave on my blog. I visit my readers’ blog and try to comment where I can make sense. Yet another way to encourage your reader’s to keep coming back to your blog. I recent incident which I remember is where Deepak of BikeAdvice.in left a comment here and this led me to discover his blog. I say discover because I would never have landed on his blog because it is about bikes’ and I am not bike enthusiast to an extent that I search in Google about it. I left a comment on the post where he shared how the blog Breaks Previous Traffic Records and now we both are connected to each other in more than one social networks and are interacting on many other front apart from blogging. Remember it is not about dropping your link in comments in other people’s blog but it is more about interacting with your readers and other fellow blogger. I could have easily commented using blog comment form on the page that would allow me to leave my link on that blog but I preferred Facebook comment. When you read other blogger’s good blog post you can re-post an excerpt of it or your own views about the same on your own blog, providing a link back to the author’s blog. Occasionally, they will even make a post on their own blog and refer to your content. I shared my views to one of the article of Manshu here and Manshu did the same on his blog here. Remember don’t post an entire article because that is illegal but posting a brief excerpt and linking back to the original is the right way. It is just not enough to write a great blog post but you also need to be a good reader to other great blogs and interact with other bloggers. How do you make yourself a better blogger – Share your views in comments below. The first point makes a lot of sense and many people do not talk about reading their own posts. When you look back, blogging first appeared as an online diary for recording our own thoughts and life events which obviously meant that we were the first to read it often. 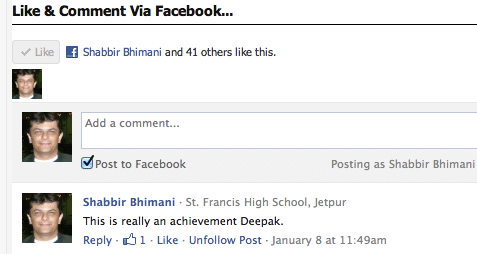 BTW, it would be great if you can integrate facebook comments in your blog. I also want to tell you that I did subscribe for your newsletter but I do not get any emails from you. I also checked the spam folder. The only email I ever got was the confirmation email. Are you sending broadcasts regularly? Yes I have plans on getting FB comments soon and I have list of lot of things that I want to be doing and one of them was to get the caching thing done and I just completed it last weekend and so yes you will soon see FB Comments as well. Yes I do send the newsletter as well as the follow ups. I see you have your both the email deepak@ and mail@ subscribed but yet to open any of the sent email.